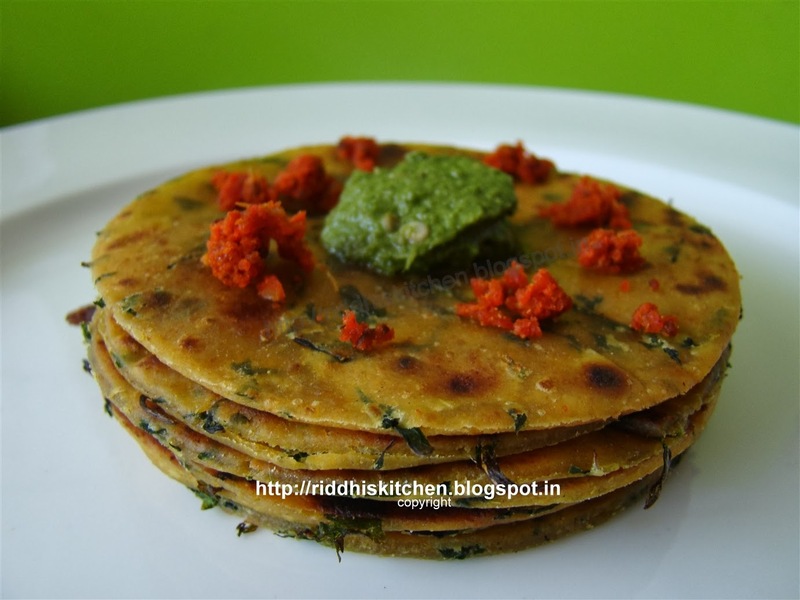 In a bowl combine together whole wheat flour, methi leaves, garlic paste, turmeric powder, red chilli powder, hing, salt, coriander powder, 2 tablespoons oil and sufficient water and knead a semi soft dough like paratha dough. Divide the dough into equal portions and roll them into thin theplas. Heat a non stick tawa and cook With oil till golden brown on both the sides. Serve hot with green chutney or dry garlic coconut chutney or pumpkin chutney. Tip : you can aslo use kasuri methi instead of fresh methi ( fenugreek) leaves.